On October 13, we lost a resolute champion of the law, a man who left his impact the lives of untold numbers of Americans. His very name made his life's work almost inevitable, a matter of destiny. William Wayne Justice was a Federal judge for the Eastern District of Texas. That's right,he was "Justice Justice." And he spent a distinguished legal career making sure that everyone - no matter their color or income or class - got a fair shake. As a former Texas lieutenant governor put it last week, "Judge Justice dragged Texas into the 20th century, God bless him." Dragged it kicking and screaming, for it was Justice who ordered Texas to integrate its public schools in 1971 - 17 years after the Supreme Court's Brown v. Board of Education decision made separate schools for blacks and whites unconstitutional. Texas resisted doing the right thing for as long as it could. Many of its segregated schools for African-American children were so poor they still had outhouses instead of indoor plumbing. This small town lawyer appointed to the federal bench by President Lyndon B. Johnson ordered Texas to open its public housing to everyone, regardless of their skin color. He looked at the state's "truly shocking conditions" in its juvenile detention system and said, repair it. He struck down state law that permitted public schools to charge as much as a thousand dollars tuition for the children of illegal immigrants. And Justice demanded a top-to-bottom overhaul of Texas prisons, some of the most brutal and corrupt in the nation. He even held the state in contempt of court when he thought it was dragging its feet cleaning up a system where thousands of inmates slept on the dirty bare floors of their cellblocks and often went without medical care. The late, great Molly Ivins said, "He brought the United States Constitution to Texas." Some say that justice stings. William Wayne Justice certainly did - and his detractors stung back with death threats and hate mail. Carpenters refused to repair his house, beauty parlors denied service to his wife. There were cross burnings and constant calls for his impeachment. After he desegregated the schools he was offered armed guards for protection. He turned them down and instead took lessons in self-defense. Shamefully I have never heard of this truly honourable person. I shall continue to read more about him, this man blessed with so much compassion. Excellent. I didn't know he was shunned in his own home town but can imagine it. Thanks for posting this story of a great American. welcome to ABH, and to tell you the truth I'm no Justice expert. 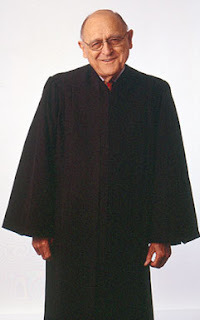 I had heard 20+ years ago of the liberal Judge Justice in Texas, and did not realize the extent of his courage. I decided to start a "personal heroes" section, and he was just the person to kick it off with. May he serve on the bench in heaven.